A few weeks back your SDSI team in total had the opportunity to attend the Brad Fowler Memorial Scholarship event on the field at Petco Park. Brad was Ron’s son, who struggled with addiction and was tragically lost at an early age. In his memory the Fowler’s started a scholarship fund for athletes who have overcome drug or alcohol obstacles and have gone on to be super achievers. Well all us most likely think we have achieved a little something by this stage in life. I was cruising along feeling pretty ok about personal achievement …’til I heard the stories from this year’s winners. I will not be able to do them justice: imagine approaching high school as a 17 year old mother, or coming from a truly abusive alcohol infused home life or being accidentally fed meth amphetamines as an infant… and from this, pulling yourself up through the portal of sports to really excel in athletics and education… imagine. It's a good thing to remind ourselves that almost all of us started with a head start, specially compared to these amazing people. I can hardly wait to see them zoom by me on the road to life… super achievers is not sufficiently descriptive. You can help sustain these awards. Go to the Hall of Champions website and click on Brad Fowler Memorial Scholarship. We departed the field at Petco aswim in emotional thoughts. I have not suffered from addiction and somehow have avoided many of the associated challenges. By the time I hit the exit and started for my trusty Jeep, I have to say I was embarrassed at the riches I have in life…wife, family, friends, SDSI…that’s my community and I was counting my blessings. Not for long. As we hit the exit I ran right into an immense human tragedy, the scope of which simply overwhelmed me. The depth and complexity of our San Diego homelessness is unavoidably there to see at a catastrophic scale. The Tailgate Park looked like an encampment: the block surrounding Father Joe’s are covered in tents and awnings and shopping carts, and of course the full and sad spectrum of the homeless community is unavoidably there. You know, the reality is unavoidable, but solutions are not impossible. It's a very complex issue, fraught with both accurate and incorrect assessments by those of who are separated from the homeless community perhaps only by luck. The good news is there are many high-minded people in the public and private sector working hard to mitigate this tragedy. Fortunately for us, one of our leaders in the sports community is in fact doing something about it: Pat Kilkenny and his wife Stephanie are directing their efforts at Lucky Duck Foundation to create real world, tangible solutions. Check “One Act of Kindness San Diego" (1AOKSD) at the Lucky Duck website. We can help them. As an example, they have created a backpack program. The contents are the must haves: socks, underwear, poncho, tooth brush, shoes or sandals, water, and hand sanitizers. Products many of us make: DONATE THEM! And for our bigger corporate members, why not create a matching gift program where your employees can make a donation to 1AOKSD and the corporation can match it. By the way Dan Shea, Peter Seidler and Pat & Stephanie are the force behind the erection of the three tents that were recently installed to help move the homeless off the streets. So, something can indeed be done. Let’s do our part here and help… donations, money, personal time. Remember, we are all God’s children! What’s the power of mentors? Or of shared knowledge? These are questions we ponder regularly around the SDSI office. Working with entrepreneurs and growing companies daily, we see the immense positive impact our mentors have, and every year when we compile the statistics for our Mentoring Impact Report, we’re so proud of the effect our Springboard program has on young companies and the San Diego Sport and Active Lifestyle (SAL) community. So, the question became, how do we serve all SAL businesses better and leverage that power of collective knowledge in new ways? Our Springboard program has a specific set of acceptance criteria for a reason. It’s because over the years, we’ve identified the types and stages of companies that can gain the most from our structured program. But we started to feel like that wasn’t enough, and it was always tough to deliver the news to an excited, hardworking entrepreneur, that their business just wasn’t quite in the sweet spot where we could help. So, we set about building new programs that would help SAL businesses from idea, to traction, to maturity. Now, instead of having one, 20-week track to help growing companies, we have a continuum of resources for the SAL community. It starts with our Gateway workshop – a half day, intensive program that covers the basics of what an entrepreneur needs to move from idea to business, with a focus on some of the most common sticking points, like prototyping, proof of concept and protecting IP. The next step for growing companies is our Accelerator program. It keeps the same successful structure and criteria as our Springboard program, but with a new name that we hope will resolve any previous confusion with Connect’s, largely tech and life sciences focused, Springboard program. And for mature companies, we recognize that with growth, comes unique challenges that can benefit from the perspective of peers who’ve been there before. Our new Masters Program is a highly confidential, executive level peer mentoring program to support companies in later stages of scale. All of these programs are fueled by the deep experience and talent of our mentors and members, who give of their time and knowledge for the greater good of the whole. This is an exciting time that makes us proud to be the hub of the San Diego SAL industry! Applications for the Accelerator program open in a few days on July 30th, and the first Gateway workshop is coming in the fall. We hope you continue to keep SDSI top of mind and send any SAL business focused on growth our way. Dana and the SDSI team. On Wednesday, July 18th the Del Mar Racetrack had another successful opening day. The unofficial San Diego holiday is quite the spectacle! From the people, smiles, crowds, horses, the big hats, to David Hasselhoff’s rendition of Bing Crosby’s classic. Remember, there are 13 concerts this year, so don’t forget to catch your favorite act throughout this season. Also, watch the season preview from KUSI with SDSI Board Member, Craig Dado. Congratulations to Sun Diego Boardshop for being named Best Surf Shop of 2018 as part of San Diego’s Best Union-Tribune Readers Poll. From the top ten nominees Sun Diego took home top honors as voted by U-T Readers. Look for the official announcement in the August 26 edition of the U-T. Visit one of Sun Diego’s seven stores to see what all the buzz is about or shop online to get some great surf lifestyle apparel. The Coast News interviewed CA Skateparks’ Jeff Jewett about their brand new Training Facility, CA | TF. Jeff talks about the international interest, youth development program, and what he is most excited for as skateboarding enters the Olympics in 2020. Read the full article for more info on this elite facility and we look forward to hosting our advisory board meeting there in August! Mike Ely, chief operating officer of cycling lighting leader, NiteRider, commented: "ZyroFisher share our commitment to providing their customers with outstanding service. As the leading parts and accessories distributor in the UK and Ireland, we are pleased to be working with ZyroFisher as we look to increase our brand presence in the region." Read the full press release. Joined by Alaska Air, MacKenzie Corp, Marsh & McLennan and others, SDSI Board Member TurningPoint Executive Search is hosting 2nd Annual Sales & Marketing Leaders of the Year Awards, to be held on October 4th at the Marriott Del Mar. Nominate your Leader today! After a summer of testing, Outside gave a recap of 2018’s best paddleboards and stuck with the spring favorite, concluding that the Surftech Bark Aleka 11’2” remains the best in show. The author/tester writes, “Surftech, which is based in Southern California, is one of the SUP industry’s largest brands, and the Aleka was designed by well-known board shaper Joe Bark. It’s built with a combination of fiberglass, bamboo, algae-based foam, and a bio-based epoxy resin. Those materials are perhaps more environmentally friendly than what is traditionally used in boards.” Read the full review. Assualt Fitness documents the opening of CrossFit Kekaha on Kauai, Hawaii. This emotional clip explains the power of positivity and healthy choices to keep the island children on the right track. Watch the full video and we look forward to a recap of the CrossFit Games which start August 1st. Bryan Pate and Brent Teal met with SD Voyager to tell the ElliptiGO story and offer some advice to it’s readers. “The years from 2012 – 2018 have been filled with dozens of amazing experiences for the team here at ElliptiGO. In total, we’ve sold more than 23,000 bikes in 61 countries around the world. More important than our company’s success, however, is the fact that ElliptiGO riders have achieved things that we couldn’t have imagined 10 years ago” Read the full story. Andy Voggenthaler was introduced to the SD Voyager readership to discuss what Race Guards is and the challenges he’s seen. Race Guards is a Springboard Graduate and has developed a great solution to ensure race participants have a safe experience. Whether it be treating blisters or administering lifesaving CPR – Race Guards has seen it all… Read the full interview. As a quick note, they are seeking a title sponsor for this one-of-a-kind program. SD Voyager (they’ve been busy this month) caught up with Doug Smith, co-founder of True Nutrition as they discussed the beginnings of their business, trials and tribulations, and how they recorded a new Guinness Book of World Records for the ‘Largest Jug of Protein.’ Read the full article and we’ll stop with the cheesy rhyming headlines now. Entrepreneur.com caught up with CBRE to find out all about the technical and cultural features of this workspace. The three-and-a-half-minute clip talks about the collaborative synergies created by this new age office layout. SDSI Advisory Board member, Andy Ewald, makes a cameo just after the 1:30 mark but the whole video is worth watching... Especially if you haven’t seen it yet! The innovative new grip sock is perfect for yoga, pilates, or dance and its creation is the result of a connection made from their manufacturer. Claire notes, “This type of sock is definitely unique and couldn’t have been produced without us coming together. We saw it as a perfect opportunity to innovate, where the consumer wins by getting the benefits of a non-slip, anatomically correct and comfortable sock.” Read the full interview. 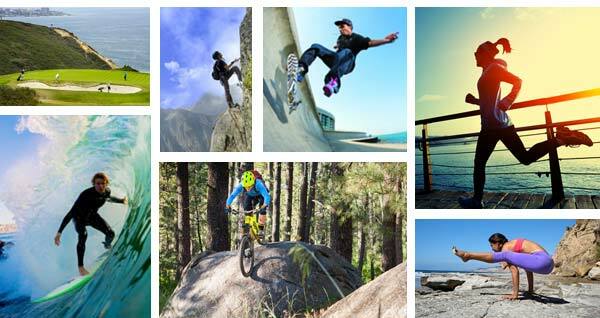 Adventure Sports Network (owned by TEN) announced that it has partnered with Vewd, the global leader in enabling over-the-top (OTT) content, meaning tv and film delivered over the internet. “Bringing our content to Vewd and its enormous global footprint was a priority,” says Kris Heineman, Director of Audience Development, at The Enthusiast Network’s Adventure Sports Group. Read the full press release. With all the dieting trends, it has hard to figure out what your protein intake should be. Fortunately, UC San Diego Health System is here to separate fact from fiction. “But will eating steak and bacon at every meal really help you get fit? Protein is essential to a healthy, balanced diet. It helps build and repair muscle. But not all proteins are created equal. The trick is in knowing how much of which kinds of protein you should consume on a daily basis.” Read the full article. Many SDSI companies were involved in San Diego Running Co.'s largest Corporate Dash yet featuring over 1,900 participants! Thanks to Del Mar Racing, ElliptiGO, Events.com, Procopio, Qualcomm, Road Runner Sports, Sony, Vantage Point Advisors, and everyone else that represented SDSI in this record breaking event! Take a look at the race results. “This coworking hub offers open space, exclusive cubicles and private offices, with prices starting at $225 a month. Showers, storage lockers, bike racks, access to meeting rooms, monthly social events and quarterly workshops are just a few of the perks members can enjoy here.“ SDSI has hosted a meeting in this space and we can agree it is a great place with amenities that cannot be replicated outside of Mesa Rim. Read about the other 14 coworking spaces on the full article. In an article highlighting fitness gear to get people outside this summer, ElliptiGO was featured as the first product of the run. The author said, “I happily rode it for hours, including on steep dirt trails, and only stopped because it was dinner time.” Look at the full list. The Senior Experience Program matches teams of students with projects submitted by local businesses and organizations. Students gain by working as consultants on rigorous, real-world projects that require teamwork and application of classroom knowledge. Businesses gain by receiving concentrated attention from bright, energetic teams that provide a fresh, independent look at their projects. Each student team works under the supervision of a faculty member. SDSI has used this terrific resource several times and we highly recommend it. Read more about the program (or ask us) and submit a project by July 31st. Denise Lee Yohn contributed an article to Forbes discussing Amazon’s Prime Day and the continuing trend of retailers making up holidays to increase sales. This allows the retailer to grow its membership base (Amazon Prime in this case) and hopefully the customer has a positive customer experience which increases their propensity to purchase from that retailer in the future. Read the full article then take a look at Denise’s other articles on brand leadership. non-profit or business. Read more about this Aug 7th event on facebook. Beginning in Oceanside, California on June 16th, Team Bemer biked 3,081 miles in 5 days, 3 hours, and 43 minutes, averaging 24.91 mph, before arriving at the finish line in Annapolis, Maryland on June 21. Team Bemer is now auctioning off two of the Custom Bikes that they road to this world record to benefit the Pablove Foundation. Read the full press release. How strong is your sales team - after they make the sale?